Inflation hysteria and the boom hysteria may both seem like they are one and the same thing. They are related, sure, and they represent similar objects. However, there are subtle differences. The mania over inflation, for example, has subsided while the one about the economy reaches its own feverish pitch. In early June, Newt Gingrich appeared on ABCNews’ The View program ostensibly to sell more copies of his latest book. As an ardent supporter of Donald Trump, the book is about and is titled Trump’s America, he was naturally asked to defend the President’s record to date. The former Speaker of the House cited the economy as the best indication for a successful first year and a half. I think this quarter we will have more than twice the economic growth rate of any quarter in the eight years of Obama. This is demonstrably false in every way. Despite the characterizations supplied by his political opponents, Gingrich is an incredibly smart and accomplished guy. To have made such an outlandish assertion is significant. For one, this quarter isn’t even over with yet. The former Speaker was undoubtedly referencing estimates, particularly the Atlanta Fed’s GDPNow tracking model, which at the time signaled GDP growth in Q2 perhaps as high as 4.5%. 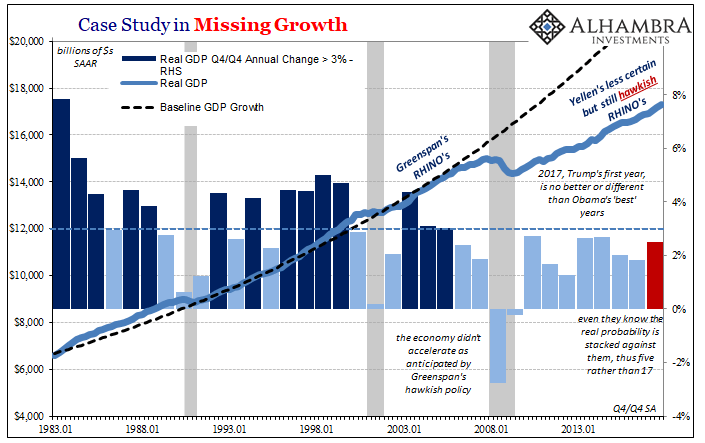 But even if that number holds (it won’t, as Newt should have familiarized himself with the initial GDPNow figure of more than 5% growth first expected in Q1 2018 that the BEA says today actually turned out to be less than 2%), it is no better than the 5.1% growth actually posted in Q3 2014 just before the midterm elections (that went heavily against the D’s). It seems he was suggesting that growth in Q2 2018, the one quarter, will turn out greater than during any of the eight years under Obama. That might end up being true, but it’s not a reasonable comparison by any means. A more consistent one would be GDP growth in the year 2017 as compared to the prior eight, which actually shows nothing much has changed. The economy of 2017-18 is demonstrably less than it was in 2014. In the factors that really matter, such as labor income, it is alarmingly worse. There just isn’t any indication this is about to change (for the better). The economy can’t even match the last mini-cycle peak before the “rising dollar” “unexpectedly” hit. It is a boom hysteria invented out of whole cloth. There is only the unemployment rate by itself, and so other numbers are blatantly distorted so as to match the economy the unemployment rate should represent – but so very clearly does not. This is a bipartisan failure. It was no different under Obama, either, as each political party now takes turns trying to distort the pitiful economic record to their perceived advantage. 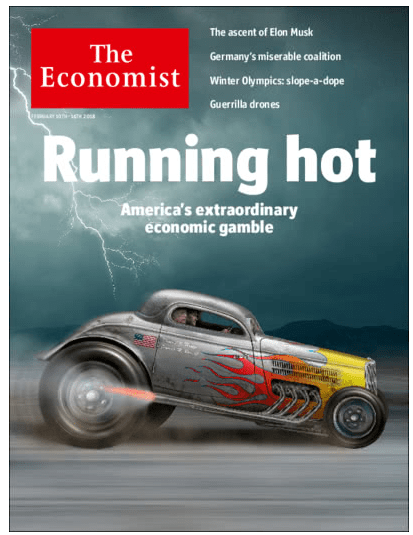 It is no longer merely a “strong” economy, it is now, apparently, “very strong.” Does new Chairman Jerome Powell have an interest in trying to make President Trump look good, or is it the usual wishful thinking of a harried technocratic institution that has been making the same claims for more than a decade to no avail? 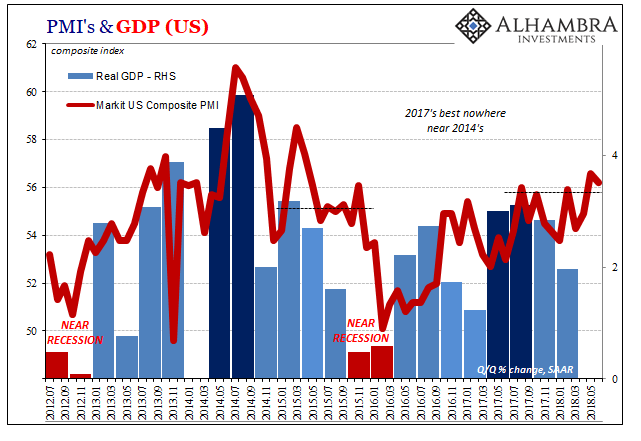 If there was no recovery following 2014’s far better conditions, it makes no sense otherwise this “very” strong addition. In my view, the appending of the word “very” is intentional just not for the reasons you might think. The FOMC rather than projecting confidence is really starting to display desperation. How do we know? There’s another passage in the minutes that suggest far more uncertainty underneath. Participants also discussed a staff presentation of an indicator of the likelihood of recession based on the spread between the current level of the federal funds rate and the expected federal funds rate several quarters ahead derived from futures market prices. Ladies and gentlemen, this is 2007 stuff. At that time, while then-Chairman Bernanke was saying subprime was contained various futures markets (especially eurodollar futures) were forecasting how such an optimistic position was a major mistake. 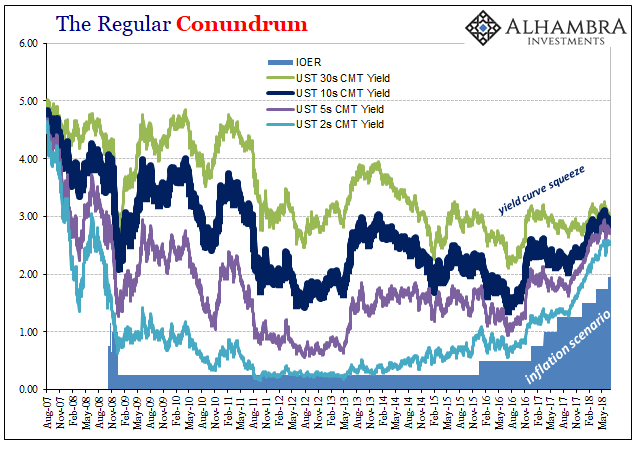 Even as the Fed had “raised rates” through the middle of 2006, these markets were by the end of that year starting to wonder not just if but when and by how much the FOMC would be forced to reverse them. The markets were right to be worried; they weren’t worried enough, as it turned out. That FOMC, of course, did its best to ignore these contrary market signals right up until the whole damn thing nearly blew apart later in 2008. 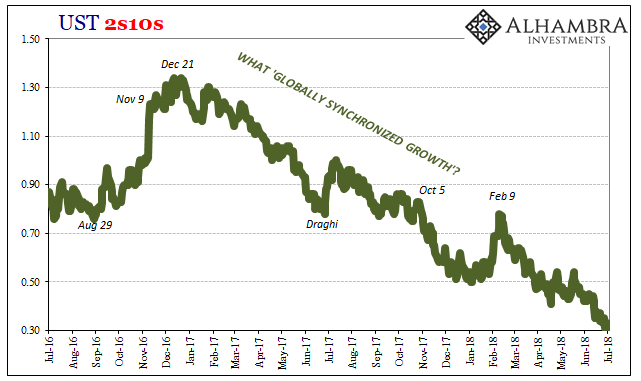 The yield curve is once more telling them they are wrong about “very strong” and even just “strong”, and now the FOMC is publishing its concerns about how they’re studying when and where the broadest and deepest markets in the world just might be right. 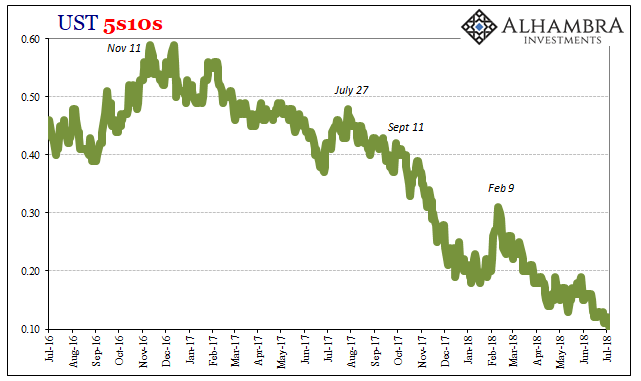 They have, apparently, even gone so far as to highlight federal funds futures which will project like eurodollar futures the dreaded “policy error” if or when the economy fails to live up to the hype – as it has consistently. 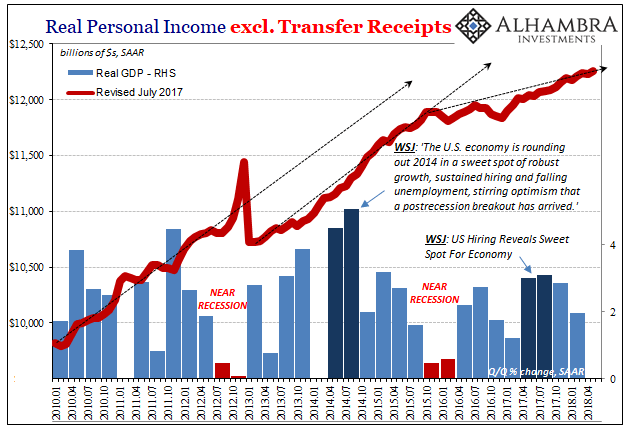 If the economy was actually very strong, there would be no need whatsoever to check federal funds or eurodollar futures. They’d have been well on board already. 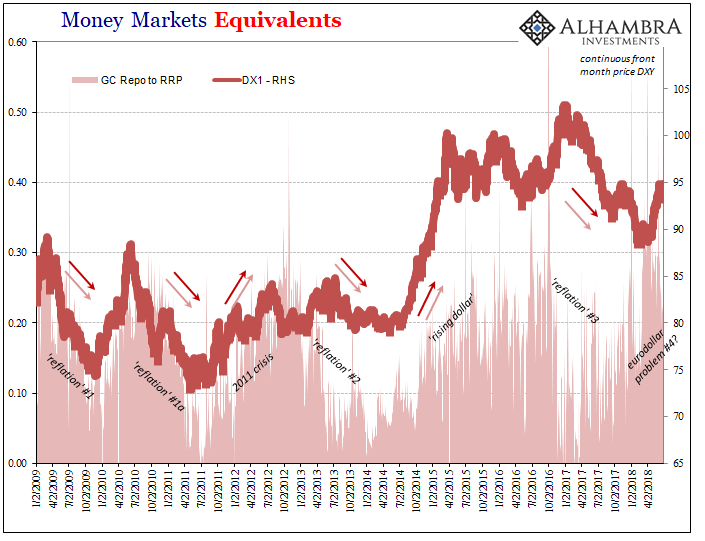 None of the curves are buying this hysteria because unlike Economists and politicians market participants were closely paying attention to what really happened after Q3 2014. Two quarters, actually, of near five percent growth meant next to nothing. It wasn’t anything like what they all said; it was pretty bad, actually. What are the chances they get it right this time? Much less than what’s claimed, and some of them apparently know it. Why not, we’ve been here before. We’ve haven’t been anywhere else.